French President Francois Hollande (left) and German Chancellor Angela Merkel take part in a bilateral meeting at the EU headquarters in Brussels on Nov. 22 as part of a European budget summit. "Fiscal consolidation, which has happened in Europe much more actually than in the U.S. so far, has had a major impact on growth," says Olivier Blanchard, director of research at the International Monetary Fund. "If you look country by country, you'll find that the countries which have strongest fiscal consolidation actually have less growth." IMF economists now foresee economic activity in the eurozone area as a whole shrinking by 0.4 percent in 2012, with Greece, Spain, Italy and Portugal suffering especially sharp declines in output. Those are also the countries that have pursued the most aggressive deficit reduction programs. But the lessons from Europe are still debatable. A country's experience, some economists argue, depends on whether the government balances its budget by spending less or by bringing in more tax revenue. "The deficit debate is often misleading," argues Harvard economist Alberto Alesina, "because it tends to ignore a huge difference between the two kinds of deficit reduction." Alesina, writing in his blog, insists the evidence from Europe is clear. "When governments reduce deficits by raising taxes, they are indeed likely to witness deep, prolonged recessions," he says. "But when governments attack deficits by cutting spending, the results are very different." David Malpass, who worked in the Treasury Department under President Reagan, makes a similar argument. "The problem Europe has had is that the countries that are doing, quote, fiscal consolidation, are doing it by raising taxes," Malpass tells NPR. "They have not been restraining government growth; that would have been pro-investment. But governments keep getting bigger and bigger, and that is discouraging to business investment." It is true that several European governments have been inclined to raise taxes rather than cut spending. Italy may be the best example. The government in Rome has enacted several tax increases, most recently in November 2011, but has encountered great difficulty in curbing public spending. The latest IMF data project that the Italian economy in 2012 will shrink by 2.3 percent. "In general, tax increases are politically easier than spending decreases," says the IMF's Blanchard, speaking to NPR. "I think more than 50 percent [of European deficit reduction] has been on the tax side, and therefore less than 50 percent on the spending side." The key question, however, is whether the composition of the deficit reduction effort really makes a difference in terms of the effect on economic growth. Conservative economists say once spending cuts are made, they're likely to be sustained. "When governments cut spending, they may signal that tax rates won't have to rise in the future," writes Alesina. Businesses may be more confident that the economy will be put on a solid foundation, so they'll be more inclined to invest. On the other hand, tax increases may discourage business investment. The IMF's Blanchard, however, pronounces himself an "agnostic" on the proposition that tax increases are more harmful to economic growth than spending cuts. "What is the evidence?" Blanchard asks. "The evidence is more or less all over the place. It's very difficult to identify whether spending or taxes have more of an effect." In contrast to Italy, the government of Latvia emphasized spending cuts over tax increases when it set out to balance its budget. And yet it suffered an even sharper economic downturn in the aftermath of that effort than did other European countries. The IMF advises countries to design their fiscal consolidation strategies — tax increases versus spending cuts — according to their own national priorities. Some governments may be spending more than they need to spend, while others may be underspending. What is certain, Blanchard says, is that the more aggressively governments tackle their budget deficits, the more economic growth will suffer. "I care much more about the degree of fiscal consolidation than about the composition of it," Blanchard says. "In the end, the composition will have to come from both spending and revenues. There's no question. What worries me much more is whether we reduce the deficit too much or too little." A healthy deficit reduction program, though painful in the short run, can put a country on a solid economic footing, restore confidence, and bring big benefits in the long run. But too much deficit reduction, too fast, can send a country into a steep recession. With the economy shrinking, the deficit could actually get worse. 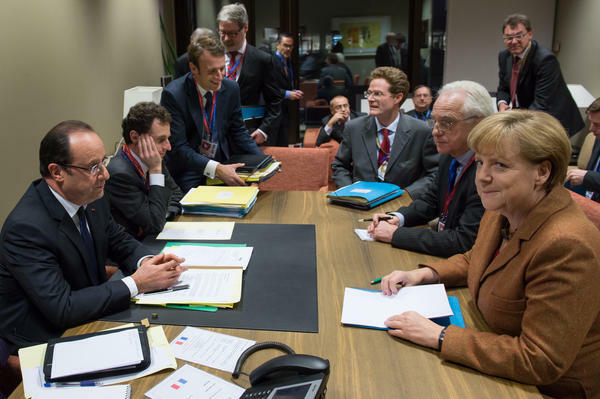 These are all lessons from Europe that U.S. policymakers now have to ponder. Now, as the fiscal standoff continues, the president and Republicans in Congress do agree that reducing the deficit requires both less government spending and more government tax revenue. It's how much of each that's in dispute. In today's bottom line, NPR's Tom Gjelten reports that it might be helpful to consider what's been tried in Europe. TOM GJELTEN, BYLINE: The first lesson from Europe is that when you set out to balance your government budget, there's a risk you'll slow your economy. Olivier Blanchard, research director at the International Monetary Fund, says the last couple of years in Europe suggest that the harder you try to close your budget deficit - this is called fiscal consolidation - the more likely you are to trigger a recession. OLIVIER BLANCHARD: It's very clear that fiscal consolidation, which has happened in Europe much more, actually, than in the U.S. so far, has had a major impact on growth. If you look country by country, you find that the countries which have the strongest fiscal consolidation actually have less growth. GJELTEN: More deficit reduction means less growth. But is it that simple? Remember, a government can balance its budget either by spending less or by bringing in more tax revenue. David Malpass, who worked in the Treasury Department under President Reagan, says when economists consider deficit-reduction strategies, they often fail to distinguish between the two approaches. DAVID MALPASS: They're putting together two quite separate concepts when what they should be talking about is government spending and, separately, taxes on the private sector. GJELTEN: Malpass does not dispute that across Europe efforts to cut budget deficits have caused an economic slowdown. But maybe the trouble is the way those governments have gone about it. MALPASS: The problem Europe has had is that the countries that are doing, quote, fiscal consolidation, they're doing that by raising taxes. And they have not been restraining government growth. That would have been pro-investment if they had done that. But governments keep getting bigger and bigger, and that's discouraging to business investment. GJELTEN: There are two statements here - first, the observation that in reducing their deficits, European governments have chosen more often to raise taxes than to cut spending; second, that this choice matters. It is true that many European governments have increased taxes and that they've had a hard time shrinking their government sector. Italy may be the best example. Olivier Blanchard at the IMF says the pattern more or less holds across the continent. BLANCHARD: In general, tax increases are politically easier than spending decreases. I think more than 50 percent has been on the tax side, and therefore less than 50 percent on the spending side. GJELTEN: OK. But does it make a difference in terms of the effect on economic growth? Conservative economists say once spending cuts are made, they're likely to be sustained. Businesses will have more confidence that an economy will be put on a solid foundation, so they'll be more inclined to invest. On the other hand, tax increases discourage business investment. So, the theory goes, tax increases are more harmful than spending cuts. BLANCHARD: What is the evidence? GJELTEN: Olivier Blanchard is agnostic on the question. BLANCHARD: The evidence is more or less all over the place. It's very difficult to identify whether spending or taxes have more of an effect. GJELTEN: In contrast to Italy, the government of Latvia emphasized spending cuts over tax increases when it set out to balance its budget, and yet it suffered an even sharper economic downturn than did other European countries. The IMF advises countries to design their fiscal consolidation strategies - tax increases versus spending cuts - according to their own national priorities. What is certain, the IMF's Blanchard says, is that the more aggressively governments tackle their budget deficits, the more economic growth will suffer. BLANCHARD: I care much more about the degree of fiscal consolidation than about the composition of it. In the end the composition will have to come from both spending and revenues - there's no question. What worries me much more is whether we reduce the deficit enough, too much, or too little. GJELTEN: A healthy deficit reduction program, though painful in the short run, can put a country on a solid economic footing, restore confidence, and bring big benefits in the long run. But too much deficit reduction too fast can send a country into a steep recession. With the economy shrinking, the deficit could actually get worse - all lessons from Europe that U.S. policymakers now have to ponder. Tom Gjelten, NPR News, Washington. Transcript provided by NPR, Copyright NPR.